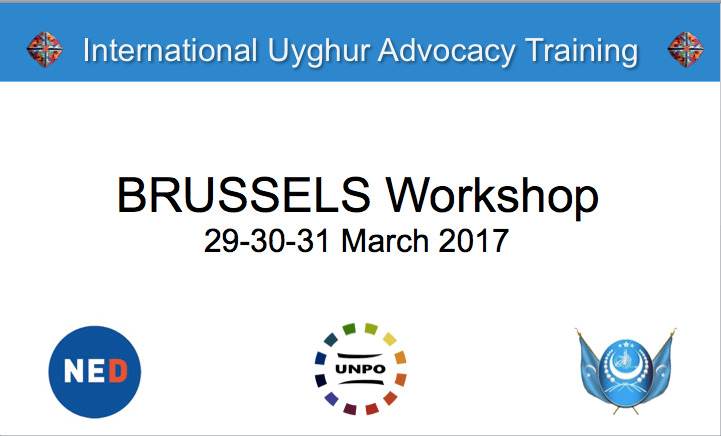 The Unrepresented Nations and Peoples Organization (UNPO), in cooperation with the World Uyghur Congress (WUC) and the National Endowment for Democracy (NED) will be organising a three-day seminar entitled “International Uyghur Advocacy Training”, that will take place in Brussels from 29-31 March 2017. The seminar is for youth from the Uyghur diaspora to provide them the opportunity to deepen their understanding of human rights advocacy at the international fora. The primary goal of the “International Uyghur Advocacy Training” seminar is to train young Uyghur activists to become reliable channels of human rights advocacy, by enabling them to cooperate with stakeholders on human rights issues and the promotion of democracy. The course will focus on providing a practical knowledge on key international institutions, a broader advocacy framework and a forum to network with peers. The participants will spend the first day of the seminar at the European Parliament, and gain an insight into the inner workings of the human rights advocacy in the EU and the challenges minority representatives face in negotiating for recognition in international decision-making fora. This day will include a guided tour and participation at a conference at the European Parliament organised by UNPO in collaboration with the World Uyghur Congress (WUC) and hosted by Ilhan Kyuchyuk MEP (ALDE) entitled “Forbidden to Move, Forbidden to Pray: The Plight of the Uyghurs in China”. This will allow the participants to get a unique insight into advocacy at the European Parliament, and the opportunity to meet Members of the European Parliament, academics and human rights experts politicians with years of experience in advocating for the Uyghur cause. The seminar will also entail a section with a detailed focus on the United Nations, providing with a specific focus on UN human rights. In addition to this the seminar will include a section with a focus on broader considerations of advocacy work, featuring sessions on how to communicate your case and promotion through social media. With a comprehensive agenda featuring a broad range of high-level speakers and trainers covering a myriad of topics, participants will gain a detailed overview of the field and gain the necessary skills to work as a human rights defender. You may find the training programme here.